SAN JOSÉ, CA. – Love always moves us, but in this love story, (based on DAVID VELASCO’s play based on JOHN LUTHER LONG’s story) written by librettists LUIGI ILLICA and GIUSEPPE GIACOSA, and set to the wondrous melodies of Italian composer GIACOMO PUCCINI for his Opera “MADAMA BUTTERFLY,” love breaks our hearts. We are moved by the purity of the love felt by Cio-Cio San, a 15 years old girl from Nagasaki, Japan, (so gentle, and so fragile that it was appropriately named “MADAMA BUTTERFLY” ) for a handsome U.S. Navy Lieutenant, by the name of B.F. Pinkerton. In her naïveté, this girl believed that an American Officer (in the early 20th Century) could actually marry a poor Japanese Geisha girl, he had bought from Goro, a “broker,” for one hundred yen. 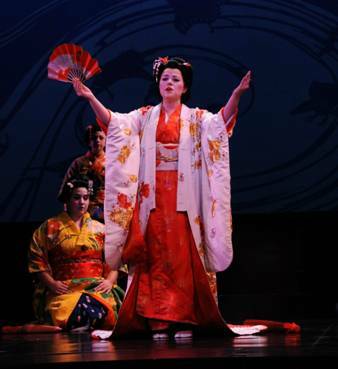 On Opening Night, the production of “MADAMA BUTTERFLY,” that OPERA SAN JOSÉ is presenting until March 2nd at the CALIFORNIA THEATRE, reunited all the elements that make any production masterful. In his last performance as Music Conductor of OPERA SAN JOSÉ, before his retirement, DAVID ROHRBAUGH directed his orchestra with such feeling, that the instruments expressed the doleful melodies of PUCCINI”s music with pathos. The cellos sobbed, and the violins cried. And as the notes moved on the staff, their sounds made the audience experience every word that was being sung. In the dramatic acting of soprano FORNI and in her marvelous flute-sounding tone of voice. the character of MADAMA BUTTERLY took a life of its own. We felt her love in her duet with PINKERTON as she sings Dolce Notte, Que ante Stelle as both the newly wed observe a beautiful starry sky above their heads. Her rendition of Un Bel di Vedremo made us experience her longing, she sang it with such feeling that it brough out tears to our eyes. After the wedding BF PINKERTON (CHRISTOPHER BENGOCHEA) leaves. He returns to Nagasaki, three years later, but he returns with his American wife to reclaim his son with Cio Cio san, to take "Trouble" (as the boy is called) with him to live in America. Cio Cio san who has been cursed and abandoned by her family for changing her religion, is now abandoned by her husband. When she refuses to marry Prince Yamadori (TORLEF BORSTING) she will have to go back to “work’ as a Geisha. As PINKERTON, tenor BENGOCHEA gave us an excellent representation of the callous man who has feigned a wedding, knowing that he could brake “his marriage contract” any time. His voice, was strong when it needed to be strong and yet had tenderness when it needed to sound tender. In his acting, he represented well the nuances of his character that goes from passionate in act one, to cold, as he reveals to the Consul his real intentions, and then changes to grief, and from grief to guilt in a dramatic scene in act III, when he finds Cio Cio san about to expire, with her son playing in front of her with a wooden boat sitting on the floor. The detail of his arrival at that particular time (which is not part of the original opera) gave this version of the work a twist that was both powerful and dramatic. And as we see the physical deterioration of Butterfly (FORNI) after she becomes aware that with "her husband" married to another woman and “her baby” about to be taken away from her, her life is over, we also observe the physical deterioration of the character of Pinkerton (BENGOCHEA) after he realizes that he took the young Madama Butterfly, in his hands, and like the butterflies (the insects) that entomologists (men who study insects) collect for their beauty piercing their fragile bodies with a sharp pin, he too, destroyed the woman who loved him by "piercing" her heart. 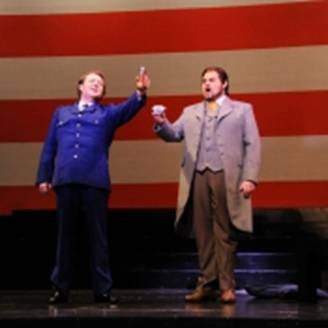 Stage Director BRAD DALTON, put realism in the performances of all the characters: Sharpless, (BRUMMEL) was diplomatic, but allowed us to sense his disapproval for Pinkerton’s actions. Susuki NICOLE BIRKLAND, acted with the humility that a maid requires. GORO (ROBERT NORMAN) acted as he was, sneaky. The Bonze (MATTHEW ANDCHEL) ferocious as his niece for rejecting her faith. The singing of all the singer was perfect. The choruses well tuned, and the acting of all the other minor characters convincing. Beautiful to look at, was the group of Geishas, who dressed in colorful costumes and carrying colorful umbrellas made the first act visual. Special mention should also be given to Trouble, represented by OWEN NEVENDORFFER, (Pinkerton’s and Butterfly’s little boy) whose stage presence on that night was amazing for a boy his age. The set (KENT DORSEY) of the opera was lean, but served its purpose, specially the starry sky. The standing ovation that the cast received on that night, lasted several minutes. It was a wonderful performance. One can say that MADAMA BUTTERFLY excelled our expectations.